Although Trachycarpus fortunei or The Windmill Palm is not the northernmost naturally occurring palm in the world (Chamaerops humilis grows further north in the Mediterranean region, and Rhapidophyllum and some Sabal species further north on the Atlantic coast of North America), the Windmill Palm is one of the hardiest, as it grows at much higher altitudes, up to 2,400 m in the mountains of southern China. 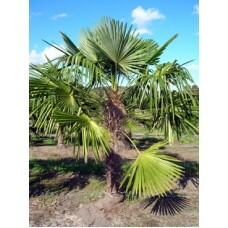 This brings the Windmill Palm into a climate not only with cold winters, but also cool, moist summers. The Windmill palm can withstand temperatures at or below zero and is near the top of the list for the most cold hardy palm. Although Trachycarpus fortunei or The Windmill Palm is not the northernmost naturally occurring pa..